Alfie’s Trust and ASDA partnering again to raise money to purchase toys for the Oncology wards at Great Ormond Street Hospital. 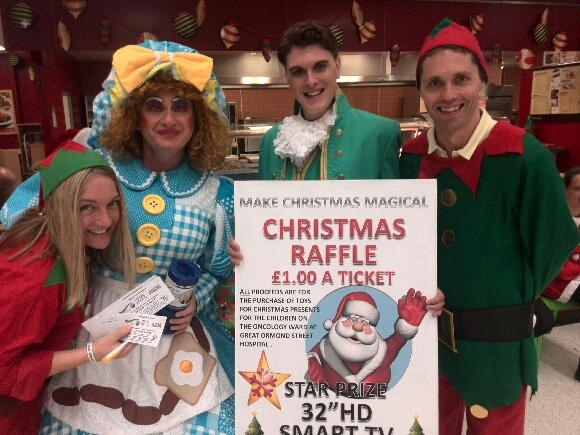 Shoppers were greeted at Asda Broadstairs by the cast of Beauty and the Beast Theatre Royal Margate, selling Raffle tickets with The Alfie Gough Trust. The Fund Raiser now in its 5th year sold over 1200 tickets during the weekend of the 28th November. All proceeds raised were spent on Christmas presents for the Children who were spending Christmas day on the Oncology ward at Great Ormond Street Hospital. Shoppers flocked to purchase raffle tickets and the response was overwhelming as always showing that the Christmas spirit is really alive in Thanet. After spending Christmas as a family on the ward in 2009 with Alfie we unfortunately learned first hand that this was to be our last Christmas together. We are well aware that many more families will be faced with this situation. This inspired us to dedicate one of the charity objectives to ensure that every Christmas is extra special for those on the ward. With support from companies like ASDA it only requires our time to make this a successful annual event. We will continue to do this every year as well as replenishing the toy room with good quality used toy which we collect on the run up to this event. Thank you to all those people who took the time to come and speak with us and purchase tickets from us over the weekend and everyone who donated there used toys and helped us clean and deliver them. W£e could not of done this without you all. The AGT Team is Growing!! !